LBI...Long Beach Island, New Jersey -- sun, surf, and sweet memories. 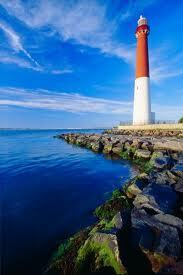 Home of Surf City and Barnegat Lighthouse! 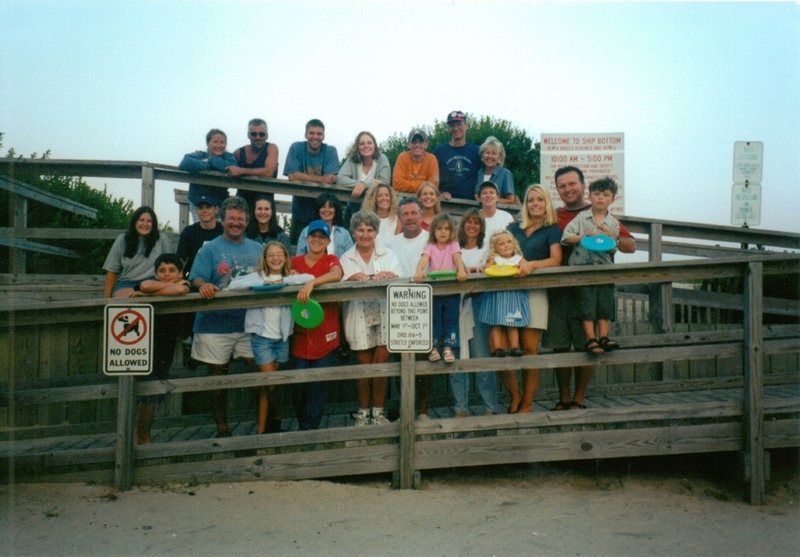 LBI was a favorite place for us Renners to vacation in our growing up years in the 1950's & 60's -- not every year but as many years as our family of 6 (and later 7) kids and 2 parents, living on one income, could afford. It was such a beloved place that my brother Conrad and family bought a beach house there in 1998...within a block from the beach, no less! One year, when our kids were grown but not yet married and out of the nest, we had the most wonderful Renner family reunion at LBI. Conrad scouted out other houses on his street that were for rent. And so several of us rented for the same week, and we all (along with in-laws, friends, and pets) descended upon that little beach community. It was a glorious week, filled with swimming, sun-bathing, sunrise watching, etc etc. But the best thing was the love and togetherness and community that "happened". We shared meals together, each family taking a turn. A year or two later, some of us rented houses again at LBI. I was hoping to recapture the same experience of that previous vacation together. Well, you know how that goes. Recapturing "glory" usually never happens. And it certainly didn't happen this time...or so I thought! For one thing, we all couldn't make it...for various valid reasons. On top of that, my brother Paul's family, including his sister-in-law's family, rented a house that was germ infested (probably from the previous renters). Everyday other members of their families "would drop like flies" with a terrible flu-bug. So there was often a "skeletal crew" on the beach from that household. 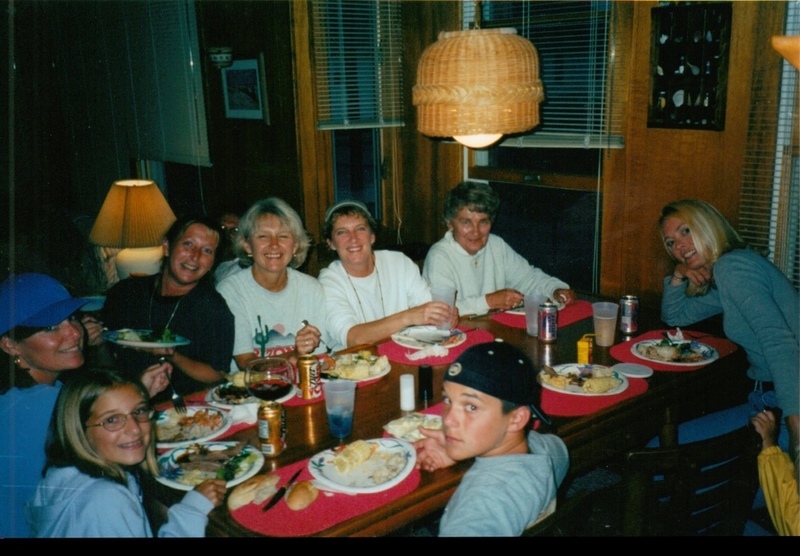 Renner Reunion 2002..."a skeletal crew"
We didn't eat together like the other year. There was little to no fellowship or community because of struggles going on in individual lives. My widowed mom, then in her mid-70"s, was staying with us. (Remember her? My hero in a previous post!) She was frustrated with issues related to our family house, which was too much for her to handle at that stage of her life! (We probably had waited too long to move her elsewhere.) So our conversations were largely negative. She had to get it off her chest, but with my expectations for a nice relaxed vacation, I was hardly as sympathetic as I could have been. Until the Lord broke through, "Enough! It's done! 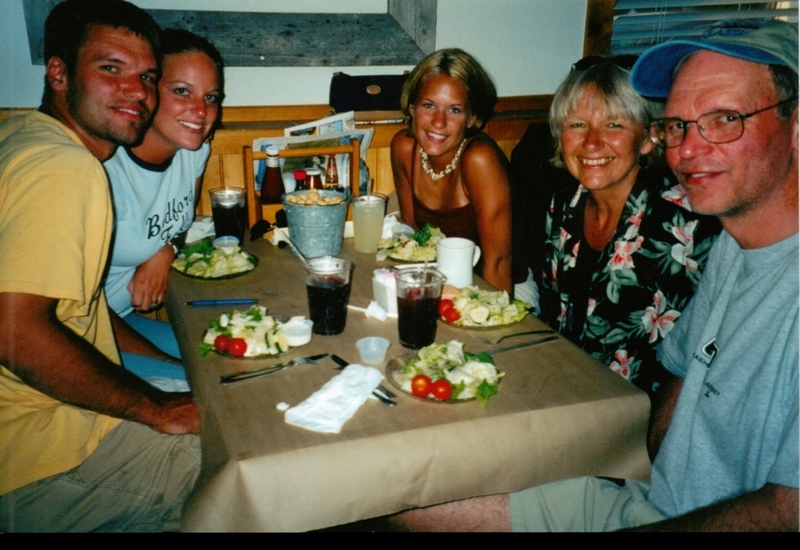 NOW when you think of this vacation, I want you to focus on the one hour of joyful bliss we had together." Oh my goodness! I had forgotten about that because of my absorption with my disappointment! It was the Wednesday of vacation week. I woke up at 5:45 am totally awake. Grabbing a cup of coffee at Bageleddi's (the local favorite), I walked alone to the beach. It was warm, and the sun had just started to come up but was not yet visible. So Jesus and I walked and talked together that glorious morning -- perfect rest in Him, enjoying together the most gorgeous sunrise I had truly ever seen. And I had forgotten it all! So whenever negative thoughts about vacation would start to again flood my mind, I remembered this one joyful hour of bliss with my Lord. As the days went by, something amazing started to happen. Other pleasant memories of our vacation started to surface: like my early morning walk to the beach only to discover a delightful sight -- my brothers and nephews fishing in the surf; and the fun supper at the Mud Hut with my husband and adult children; and a surprisingly wonderful conversation with an in-law that I didn't typically connect with. By God's grace, He saved me from a root of bitterness in my heart. As I began to reflect on what had happened in me, I started to realize what I've come to believe is a spiritual principle: We become like what we focus on. So here's the question, dear friends: What are you focusing on right now? Maybe you need to hear the Lord say (as I did), "Focus on Me and remember joy!"